For some reason this one needs you to manually type it in or else in won’t work. 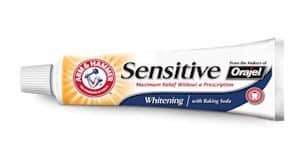 So type in freeAHsensitive.com into your browser to visit the Arm & Hammer site. Then just fill out the easy form to request your sample. Allow 4-6 weeks for it to arrive in your mail. The website is giving a nasty error on hitting submit. The new link gave an error too. Firefox 11, in case anyone else gets it. I’ve been trying for 2 days to get this. Keep getting error message. Frustrating! I got right in. You have to use caps on the AH in web address. Thank you for this sample. Can’t wait to try it. I COULDNT GET MY SAMPLE,CUZZ IT KEEPS SENING ME TO A UNEXISTING SIGHT!! I have been waiting to try this since my teeth have suddenly developed a sensitive spot. This is a really good toothpaste! PLEASE ive always wanted to try tooth whitening toothpaste! I would like to try this toothpaste..Colgate is my stabdard but Arm And Hammer is a good brand,I’d try it!